Why think about creating a Saint Patricks Day homeschool unit study? I am far from Irish. But both my daughters have Irish blood flowing through their veins. So, I feel an obligation to introduce them to all of their roots. During the month of March, we are studying all things Irish. What we are studying includes the origins and popularity of Saint Patrick’s Day. Far be it for me to allow them to think it’s just a day to dress in sparkly green clothes and drink Guinness. First of all, most know that he is the (primary) patron saint of Ireland. That he was a Romano-British Christian missionary and bishop there. Also, that Irish pirates captured him and took him to Ireland. Where he was a slave for six years. After his escape, he received a vision calling him back to Ireland. However, there are many legends that go along with Saint Patrick. Check out these legends (and the fact-checking) below. 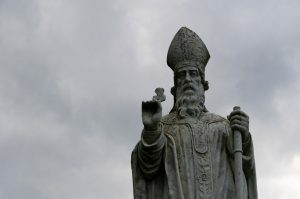 Legend credits Saint Patrick with teaching the Irish about the Holy Trinity doctrine using a shamrock. The story first appeared in writing in 1726. Although, the tale might be older than that. As a result, the shamrock is a central symbol for Saint Patrick’s Day. Three is a significant number in pagan, Christian, and other religious philosophies. 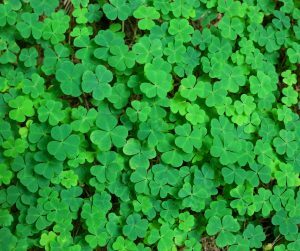 Using the shamrock’s three leaves may have aided Saint Patrick in his evangelism. There are not that many snakes in Ireland. This fact gave rise to the tale that Saint Patrick banished the snakes from Ireland. Apparently, snakes attacked him during a 40-day fast on top of a hill. Because of the attack Saint Patrick chased them into the sea. Evidence suggests that post-glacial Ireland never had snakes. “At no time has there ever been any suggestion of snakes in Ireland, so [there was] nothing for St. Patrick to banish,” says naturalist Nigel Monaghan. Nigel is the keeper of natural history at the National Museum of Ireland in Dublin. He has searched extensively through Irish fossil collections and records. On Saint Patrick’s Day, walking around without wearing some form of green on your person is not cool. In fact, you will probably (more like definitely) get lovingly pinched by someone. I say lovingly, but we know how crazy some friends can get. It is customary to wear the shamrock or some green clothing on this day. Exactly where did this tradition come from, though? Well, the color green has been associated with Ireland since the 1640s. The Irish Catholic Confederation used the green harp flag. Green ribbons and shamrocks have been worn on Saint Patrick’s Day since the 1680s. In the 1790s, green was associated with Irish nationalism because of its use by the United Irishmen. “Wearing of the green” are words from a song lamenting the persecution of United Irishmen for wearing the color green. During the ninth and tenth centuries, Irish in Eurpoe were already celebrating the Saint Patrick’s Day feast. However, the Catholic Church did not place it on the universal liturgical calendar until the early 1600s. Since then, it became a holy day of obligation for Roman Catholics in Ireland. The church calendar avoids the observance of saints’ feasts during certain solemnities. So, the saint’s day is moved outside those time periods. For example, when 17 March falls during Holy Week, it affects Saint Patricks Day. As a result, in 2008, it was officially observed on 14 March to keep it from bumping into Palm Sunday. It happened before in 1940. It won’t happen again, though until 2160. Yet, the festivities can still happen on that day or on a weekend near 17 march. 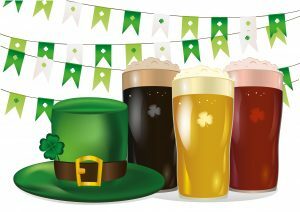 The Bank Holiday Act of 1903 made Saint Patrick’s Day an official public holiday in Ireland. Here’s what I thought was so funny. James O’Mara was the Irish member of Parliament who introduced the act. He also later introduced the law requiring all public houses shut down after drinking got out of hand. So, there was no public drinking in Ireland on Saint Patrick’s Day! At least, not until the 1970s when it was repealed. Many different areas celebrate Saint Patrick’s Day in their own unique way. The governement of Ireland began a campaign to use Saint Patrick’s Day to showcase Irish culture. They held the first festival on 17 March 1996. In 1997, it became a 3-day event. By 2000, it was four days. By 2006, five days. In Malaysia, the St Patricks Society of Selangor organizes a yearly ball. The biggest celebration in Asia. Unfortunately, many have come to associate Saint Patrick’s Day with loud parties, public drunkenness, and disorder. have strayed from their original purpose – honoring Saint Patrick and Irish heritage. In the United States, it is interesting to note that Saint Patricks Day is a legal holiday in only two areas. However, Saint Patricks Day has been celebrated since the late 18th century. It is surprising that the first observance of Saint Patrick’s Day in 1737 Boston was not a Catholic one. During that time, Protestants dominated Irish immigration to the colonies. Even New York’s first observance was held at the home of an Irish Protestant. In my opinion, no unit study is complete without cool trivia. And a Saint Patricks Day homeschool unit study should be no different. The new immigrants adopted Corned Beef. It is not a traditional Irish dish. Over the years, Saint Patrick’s Day has become a day of celebration and festivities. Of course, we can debate whether the patron saint of Ireland would approve or object is. Nevertheless, people of Irish and non-Irish descent celebrate this day with its legends and unwitting insults. 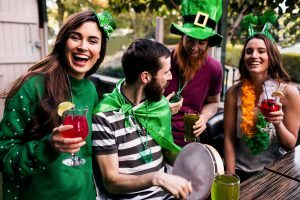 Upon ending our Saint Patricks Day homeschool unit study, I found that the holiday has much more substance than just wearing green and drinking beer. I was proud to introduce my kids to that not so well known part of their heritage.